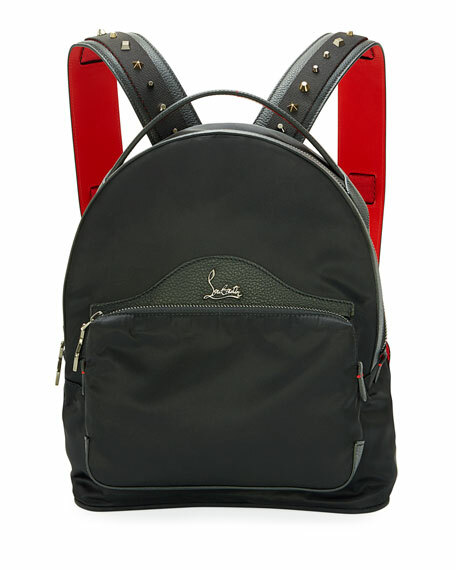 Christian Louboutin canvas backpack with leather trim. 11.2"H x 7.7"W x 8.1"D.
Chloe calf leather and suede backpack. Approx. 7.8"H x 9.1"W x 5.5"D. Removable, adjustable shoulder strap. Adjustable backpack straps. Flap top with chain-clip and ring detail. Side zips expand sides of bag. Interior, twill, cotton lining; one zip pocket. "Faye" is made in Italy. Rag & Bone calf suede backpack with smooth leather trim and silvertone hardware. Flat top handle, 2" drop. Adjustable shoulder straps. Zippered flap top with logo detail; snap closure. Woven leather drawstring opening. Fabric lining; two slip pockets. 12.5" H x 9"W x 5.8"D. Imported.